Without a doubt, when it comes to Emergency Supplies for use during and after a Disaster, you do not want to compromise. You want to have a Survival Kit that is filled with useful products and supplies that will enable you to get through the day(s) until normal circumstances return. We here at JJWTech, Inc. use common sense when adding kits to our SafeTkits™ brand of products to ensure you get a great value for your money. We take Safety seriously unlike some companies that offer emergency kits filled with -what we consider- useless items, just to boast their overall item count by listing every single item inside their kits in an attempt to try and impress you. Seriously, does it really matter if an emergency kit comes with 293 items when 50 of them are plastic bags and another 63 of them are bandages of various sizes? NO, it doesn't! What matters is that the tools and supplies inside your kit are selected to meet your needs during a disaster. So instead of 50 plastic bags which you probably already have lying around, many of our Survival Kits come with a pocket knife instead. Or rather than including a useless crank flashlight which will always be empty especially in the middle of the night when you need it the most(! ), we include flash lights with batteries that work at the flick of the switch, not after 60 seconds of leaving you exposed to danger while cranking. Every item that goes into one of our emergency kits or that is sold individually has been tested and evaluated for it's usefulness during and after an emergency. And in the process, many items that were presented to us by manufacturers for inclusion in our product lineup were rejected for various reasons such as price, difficulty of use, quality concerns, limited availability of spare parts or refill components, etc. As we said before, we take your safety serious. We are the manufacturer of our survival kits and not just a reseller. We are not a PO Box based company and we understand the products we offer to you. Before you buy online, check a company's 'contact page' to see if they show a physical address or phone number to call. If not, then you might be buying from a home based 'bedroom' reseller that probably never even saw or touched the products they offer! All they do is buy from the cheapest supplier that drop ships the products for them and increase the price for their own profits. Please do your research so you know who you are buying from! We operate our warehouse on site and we touch and inspect every item and component we sell. 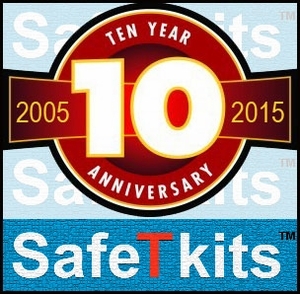 To celebrate the 10 year anniversary of the SafeTkits™ brand, we offer savings of $10.00 for purchases over $100.00 by entering coupon code 10saver during the checkout process.